Hearts and Hands: Leaning Tree is America’s favorite greeting card that are beautifully crafted and feature original artwork by outstanding independent artists from across the country and around the world. • No extra postage required! 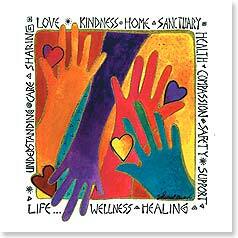 Tagged card, care, compassion, greeting, healing, Health, home, Inspiration, Kindness, Life, Love, Motivation, safety, sanctuary, sharing, support, understanding, wellness.